BMAF has just posted a very important new article by Brian D. Stubbs, a linguist on the faculty of Utah State University, San Juan (Blanding) Campus. Click on this link to read the article. Stubbs is one of world's foremost experts on the Uto-Aztecan language family whose languages include Shoshoni, Comanche, Ute, Hopi and Nahuatl. Nahuatl was the language of the post-classic Aztec Empire headquartered at Tenochtitlan in modern-day Mexico City. He has published in The International Journal of American Linguistics IJAL and with Mexico's Instituto Nacional de Antropologia e Historia INAH. In 2010, he and collaborators published White Mesa Ute: A Dictionary and Lessons. He has worked on a Tewa vocabulary. Stubbs' major publication Uto-Aztecan: A Comparative Vocabulary appeared in 2011. This 435 page masterwork analyzes over 2,700 cognate sets from forty branches of the language family. The book, three decades in the making, is highly regarded among native American linguists as is Stubbs' website, Uto-Aztecan. 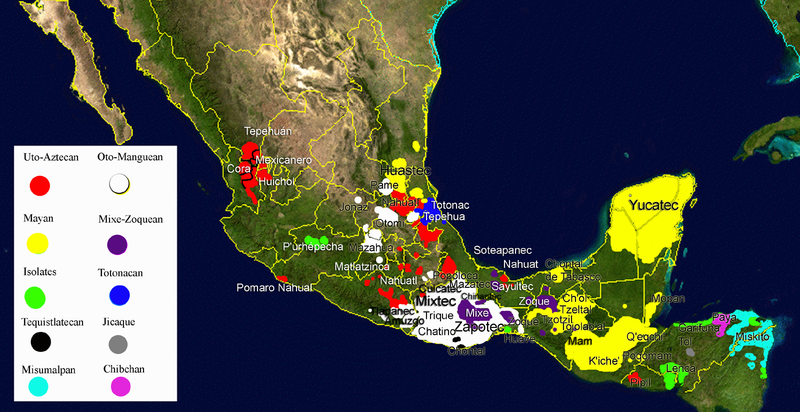 This map shows contemporary language family distributions in Mesoamerica with Uto-Aztecan in red. Obviously, Mayan was the language of the Maya. Mixe-Zoquean was probably the language of the Olmec. Oto-Manguean was the language of the Mixtec and Zapotec. Uto-Aztecan was the language of the Aztec. The language of Teotihuacan remains a linguistic enigma. Stubbs' accomplishments in native American linguistics are impressive for one scholarly lifetime, but there is much more to the man. He was trained at BYU and the University of Utah in Near Eastern languages and has expertise in Egyptian, Hebrew, Arabic and Aramaic. Many LDS scholars, once they achieve a certain stature in their profession, are reluctant to deal with the Book of Mormon for fear of damage it might cause their careers. Brian Stubbs is one of those brave souls (John E. Clark is another) who has not shied away from serious engagement with Mormon's Codex (John L. Sorenson's apt term). His 1988 FARMS Preliminary Report entitled "Elements of Hebrew in Uto-Aztecan: A Summary of the Data" caused quite a ripple in Book of Mormon scholarly circles. That article was described in "Hebrew and Uto-Aztecan: Possible Linguistic Connections" in John W. Welch, editor, Reexploring the Book of Mormon (Salt Lake City: Deseret Book and FARMS, 1992). Other articles of interest to students of ancient scripture followed. See the list of publications by Brian D. Stubbs maintained by BYU's Neal A. Maxwell Institute for Religious Scholarship. Many have been anxiously waiting for a book-length treatment by Stubbs of his 1988 material. That now appears imminent and the 16 page BMAF article entitled "Egyptian and Semitic in Uto-Aztecan" is the appetizer for what promises to be a full on scholarly banquet. See the blog article "Book Notice - Exodus Lost by Stephen C. Compton" for information about another important book that shows powerful ancient historical connections between Egypt and the Olmec.